This weekend was my amazing friend Tara's birthday! 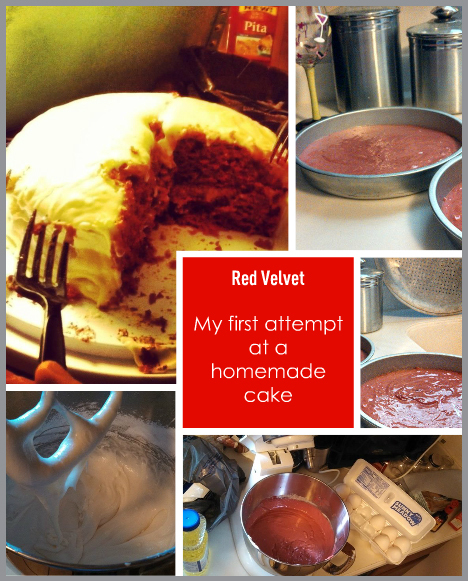 Her husband asked me to make her favorite cake...Red Velvet! Ok I have for some reason always been scared of this cake. I have never tried it from a box and yet some how I convinced myself that I was going to bake it from scratch!!! Step 3.... Make the trip to the grocery store and get all these ingredients and a new cake carrier since we will be staying at the hotel that night. Step 4.... Realize I forgot the list!!! Thankfully I only use Food.com for recipes so it was easy to find on my cell phone and I just used that. Yes it was amazing!!! We didn't even use plates! we just ate the cake straight off the carrier.